Ouch. It's a drag when you make a deposit at an online casino and then don't win a penny. Fortunately casino's like Intertops Poker and Juicy Stakes Casino give Cashback on busted deposits! If you deposit between Tuesday, January 15th and Sunday, January 20th, and then play any of the casinos’ slots from WorldMatch without a win, can get a quarter of your deposit back. Get up to $250 cash back if you play without a win. Cashback must be requested within 48 hours of the deposit. There is a 10X playthrough requirement. Cashback requests can also be made by email or phone. All Worldmatch slots qualify for 25% Cashback. 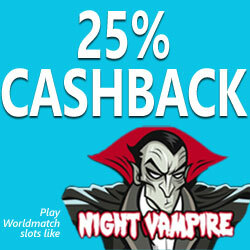 Night Vampire HD, a hi rez 5-reel slot with bidirectional lines, is the Game of the Week this week. In its three Bonus Games, players guess the colour of the horses that pull the coach of the Prince of Darkness, kill the bats, or play the Free Spin Bonus. An Expanding Wild can randomly appear making all spots on the reel Wild. With Worldmatch’s unique Social Integration feature, players can share game highlights with friends without leaving the game. Intertops Poker: Casino Games section and at Juicy Stakes Casino. In addition to their casino games section with slots, video poker, Blackjack, Roulette, Baccarat and Craps from Betsoft, Worldmatch and Lucktap, Intertops Poker and Juicy Stakes are known around the world for their busy online poker rooms and many daily poker tournaments.